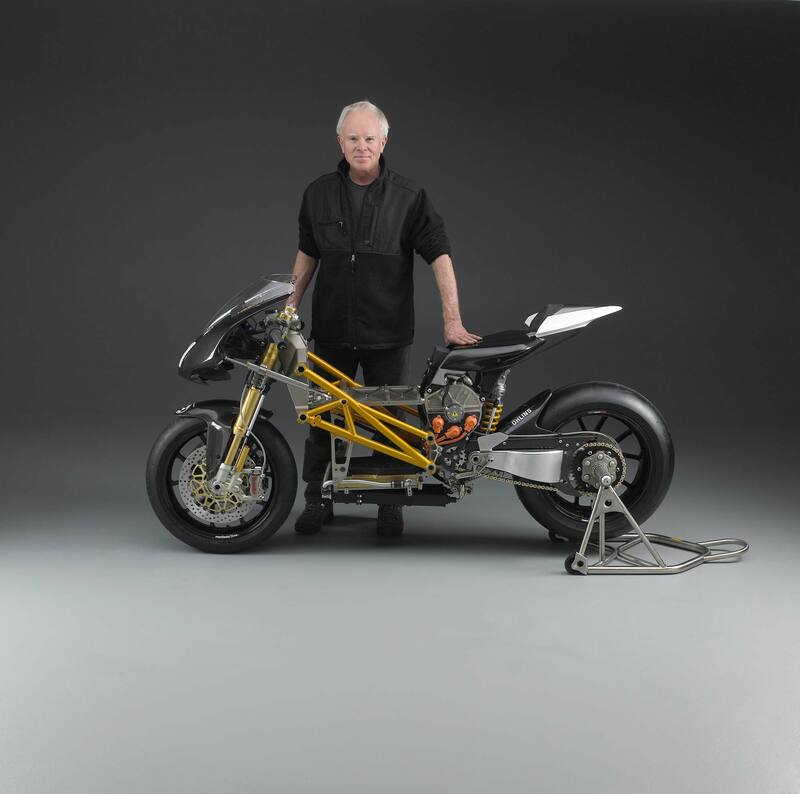 The Mission R, the latest creation to come from San Francisco-based Mission Motors, looks like any typical gasoline-powered sportbike (well, any really good looking gasoline-powered sportbike), and that’s sort of the point behind the machine: an electric motorcycle that can excite petrol-heads and electron nerds alike. Although the Mission R was made to draw mainstream appeal, today we see further proof that any resemblance to modern ICE motorcycles was made to be only skin deep. 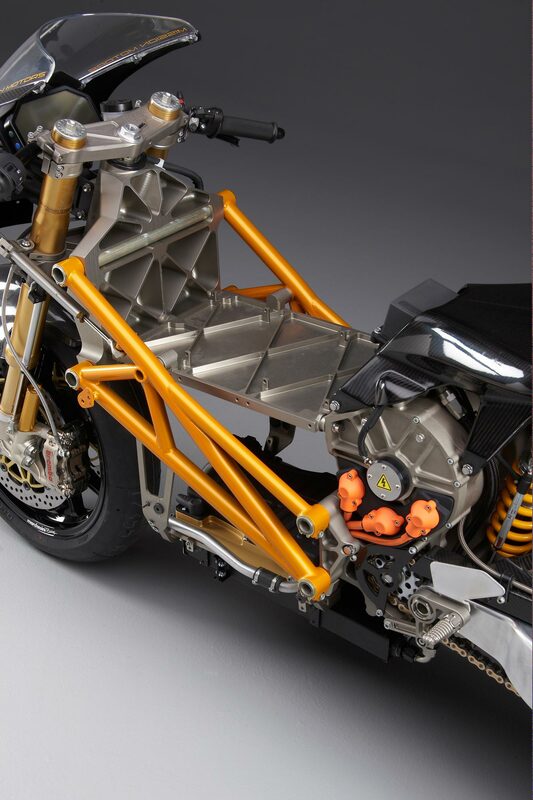 Beneath the carbon-laid fairings of the Mission R, we see a hint of the bike’s unique chrome-moly trellis frame that mates to a previously hidden headstock/front sub-frame unit that was made by Speedymoto and designed by James Parker (of GSX-RADD fame). With the Mission R’s mass centralized around the 141hp 3-phace AC induction motor, Parker also had to contend with Mission’s carbon enclosed two-tiered battery pack that comprises the bulk of the race bike’s weight. Read after the jump as Parker walks us through his process and thoughts on designing the Mission R, and be sure to check out the photo galleries for an up-close look. 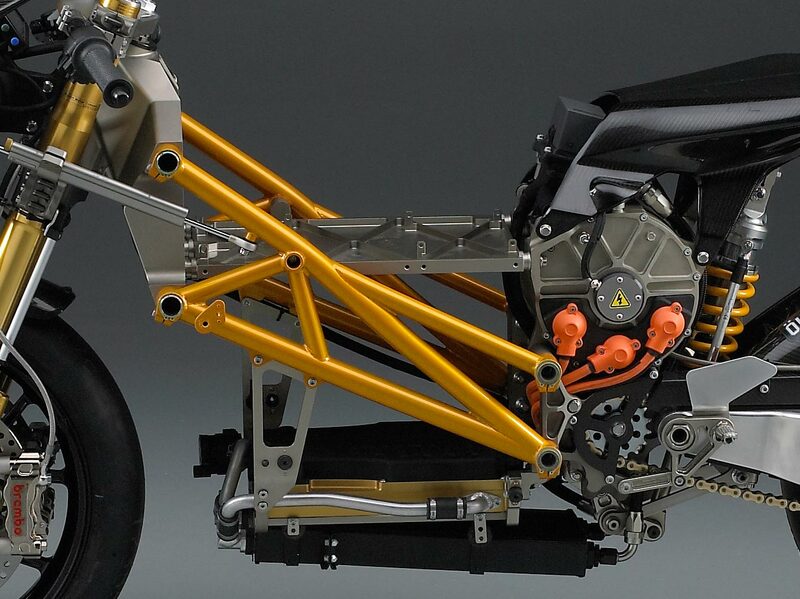 Any motorcycle chassis design combines three basic design elements into a cohesive whole. The three elements are: components, geometries, and packages. “Components” are the basic parts of the bike: Motor, frame, suspension, wheels, brakes, bars, footpegs, and more. “Geometries” are the spatial relationships, measurements and paths of motion of the parts: Rake, trail, wheelbase, wheel travel, center of gravity, and a lot more. “Packages” are the spaces components and geometries have to fit within: The lean-angle package that lets the motorcycle corner at speed, the ergonomic package that gives the rider a place to operate effectively, the aerodynamic package that keeps the rider and motorcycle parts out of the airstream, and the assembly and servicing package that gives mechanics access to every necessary part and fastener. 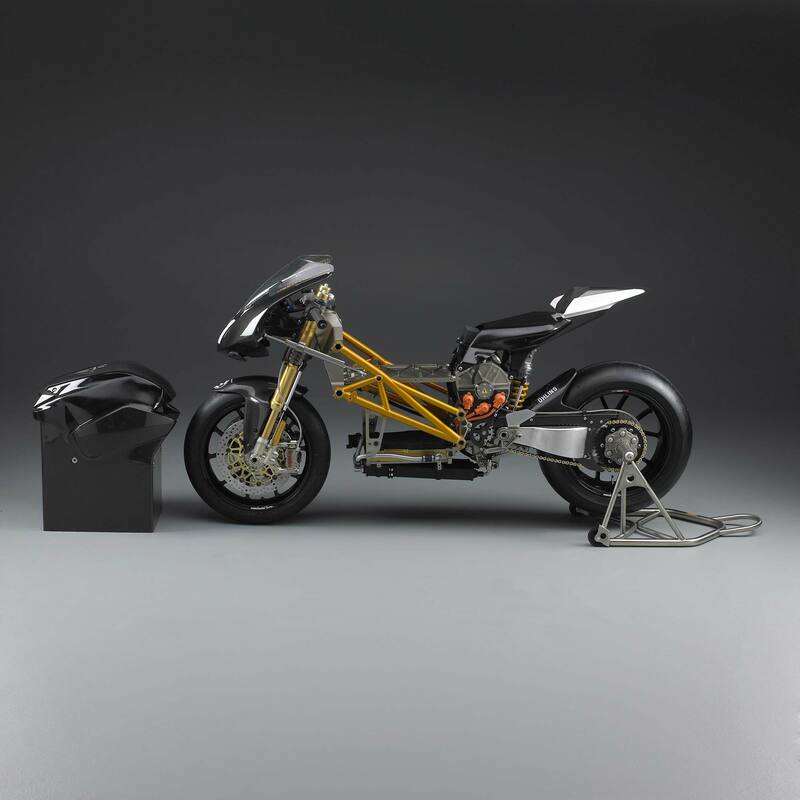 In designing an electric motorcycle, geometries and packages need to be very much analogous to those in a ‘conventional’ motorcycle, but the components are very different. Since the electric components need to work with, and fit within relatively conventional geometries and packages, there is a lot of re-thinking to do. 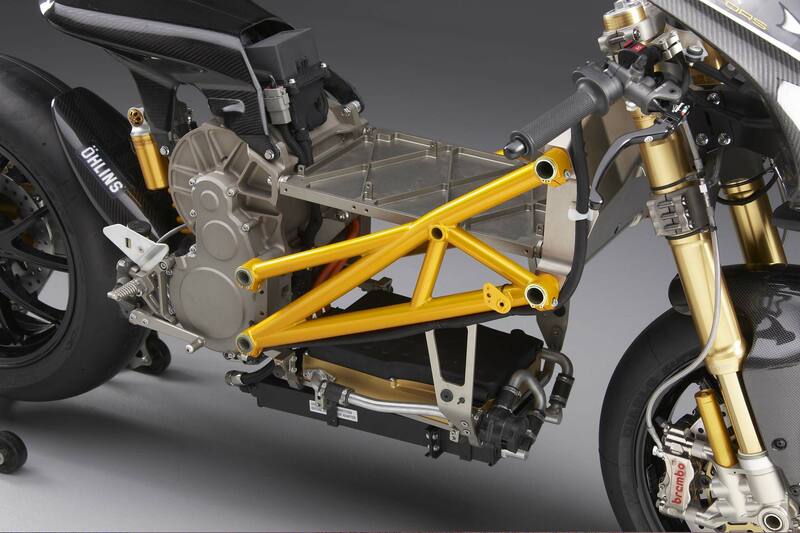 The Mission R chassis uses unique components to achieve the geometry and packaging demands of a high-performance motorcycle. The battery is a large box surrounded on four sides by three different structure types. At the front, a machined aluminum box serves as the steering head/fork mount and spans the full width of the battery. At the rear, the fully stressed “power unit” contains the motor, primary drive, and countershaft as well as the pivot for the swing arm. On each side of the battery, connecting the steering head box and the power unit, are chrome-moly steel trellis sections. The battery is thus surrounded by protective structure to insure maximum safety. An aluminum plate that is integral to the battery serves as a further chassis element, providing longitudinal and lateral bracing to the 4-sided structure. In the stripped bike photos we’ve left a battery plate in place to show the structural connections clearly. In actual use the entire battery, including the battery plate, is installed or removed as a unit, lifting from above. 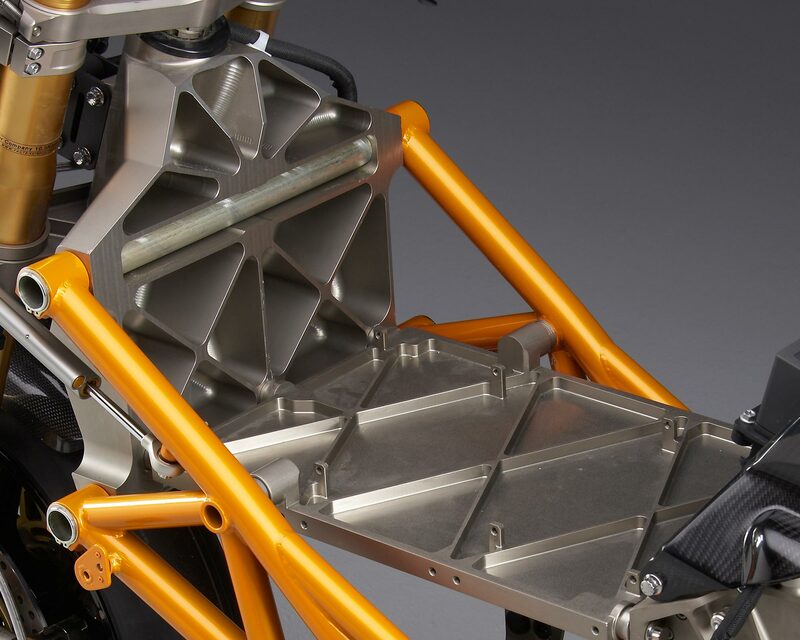 The power unit has several structural functions: As well as a mounting for the swingarm pivot and the trellis sections, the power unit provides mounting points for the rear suspension linkage rocker on its bottom surface, and on the upper radius, provisions for the structural carbon-fiber seat base and the attached upper shock mount. 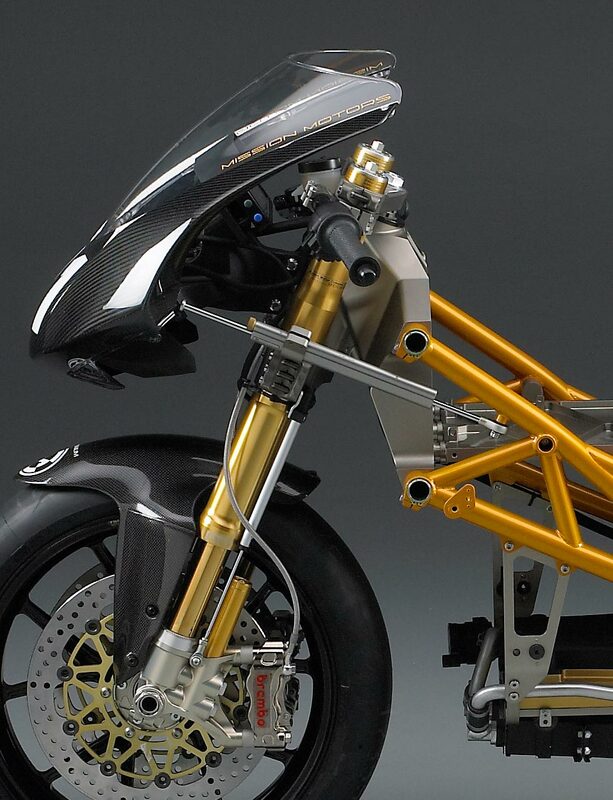 The single-sided swingarm, machined from billet aluminum, has a unique linear telescoping, rather than eccentric (as on other single-sided designs) chain adjustment, which allows adjustment without altering ride height. 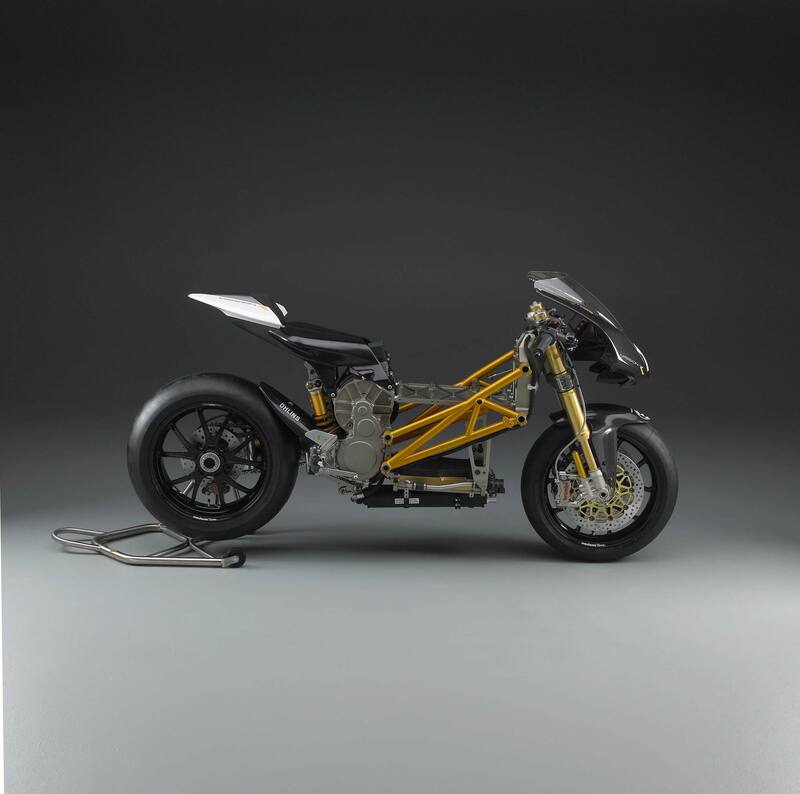 The Mission R’s electrical and structural components work with superbike geometries and packaging requirements to reveal a unique approach to designing a high-performance electric motorcycle. We’ve achieved a compact, mass-centralized design that uses new approaches to the problems of chassis design in harmony with new energy sources and new drive systems.